I like to place Buddhas and Bodhisattvas in the environment where I am living and working. For this piece I used Hawaiian landscape elements and local wildlife including a mynah bird and a neighborhood rooster. Moku Hanga is a labor-intensive traditional Japanese woodblock technique. 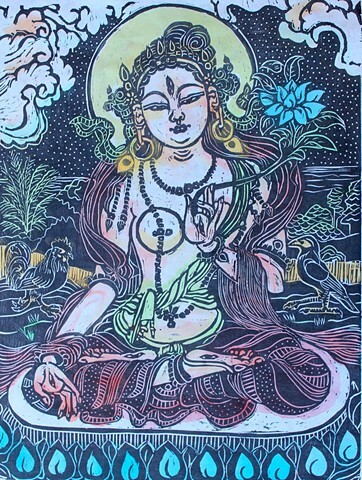 The woodblocks are hand carved, and hand rubbed using sumie watercolor inks with a barren onto fine mulberry paper. Traditionally separate blocks are carved for each color. I have been experimenting with individually watercolor painting each hand rubbed print. As a result, colors vary with each woodblock print.